Enjoy a professional massage at your hotel and relax or have all the stress and tension eased away with a wonderful hong kong massage. Our Experienced Therapists are ready to relax your mind and relieve your weary body. 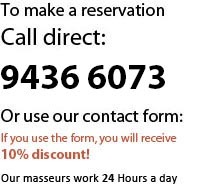 Try out our expertise in body and foot massage. If you fancy being pampered and treated whilst at your hotel have a mobile therapist visit your room lay back and relax this service is for you. Have your treatment booked for when you get back to your hotel relax in the evening or revive in the morning. So if you are just planning to be in town with some time out this is for you! Please explore the site prices & questions are answered on here. Stimulate your senses relax revive feel good!